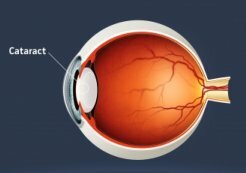 Cataracts, are protein that clump together over the lens of the eye, causing blurred or cloudy vision. The lens of our eye is composed of mostly protein and water. Over time, some protein may clump together and form a cloud over the lens. Since the eyes are one of the most prone organs to oxidative stress, it is also most prone to eye disorders. As we age, the risk of developing these protein buildup or clouding increase. Other factors that increase this risk are having the metabolic disorder diabetes, smoking, and prolonged exposure to sunlight. Early symptoms such as blurred vision can be corrected by wearing proper eyeglasses or using appropriate lighting. Taking antioxidant supplements such as the phytochemicals lutein and glutathione can help in fighting the oxidative stress that occurs in our eyes. When it has progressed to the point of impairing your vision seriously and affecting your daily life, then your eye doctor may recommend surgery. Cataract surgery is a common procedure. It is, in fact, one of the safest and effective type of surgery there is. In the U.S. where more than 3 million undergo this type of surgery every year, 9 out of 10 regain 20/20 to 20/40 vision after surgery. During the surgery, the clouded lens is replaced by a clear, plastic intraocular lens (IOL). Since U.V. ray exposure is linked to the clumping of protein over the eye lens, it is best to wear sunglasses with U.V. protection when going under the sun. Wearing a wide-brimmed hat or using an umbrella are also practical. Apart from avoiding sun exposure to the eyes, good nutrition is your best bet to prevent any eye disease or inflammation. Antioxidants have been shown to contribute to good eye health. The most common are the Vitamins A, C and E. In recent studies, the phytochemicals, lutein and zeaxanthin, have shown to reduce the risk of developing AMD or age-related macular-degeneration. What about the master antioxidant, glutathione? Glutathione can help to prevent the clouding of the eyes by reducing oxidative stress. Glutathione, just like lutein and zeathanthin, is an antioxidant. And as such, it helps fight free radicals that cause inflammation of the eyes. GSH, being an endogenous antioxidant,has the advantage of working within the cells of our body, not outside. Diabetics are especially prone to eye disorders. And diabetic patients almost usually have low levels of the master antioxidant. Increasing glutathione levels for diabetic people will therefore help in preventing cataract/s formation. Learn more about oxidative stress and its implication to our health! How can glutathione help in people with metabolic disorders? Click here. For further information about how to avoid age related disorders, discover Age-well.org This website provides great strategies on ageing well and living a long, active life.